We had a very successful Fundraiser in 2017 and plan to repeat the event again in the Spring 2018. Last year’s event was held Sunday, April 30th, 2017 at the Eagle Vale Golf Club, Fairport, NY. We had more than 100 guests who enjoyed refreshments. Watch for more information in April 2018. a silent auction, and dance related entertainment. 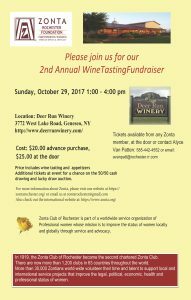 Zonta Club of Rochester raises funds that are invested in our community to improve the lives of women and girls. Everyone loved the fabulous donations last year! • Volunteers of America Working Wardrobe Program. Donations to the Zonta Rochester Foundation are tax deductible, and 100% of the proceeds will go directly to agencies funded by Zonta. As a contributor, you will be acknowledged on our Facebook page as part of our pre-event advertising. Thank you to all who support our Zonta Club and what we stand for! Fall Wine Tasting Fundraiser – Last year we enjoyed wine from A Gust of Sun Winery. Planning is now taking place for an October wine tasting event. Talbots Fun & Make a Difference Fundraiser, Thursday, December 8th, 2017 Our Fundraiser was held at 66 Monroe Avenue, Pittsford, NY. February Lucky Draw Fundraiser We sell tickets for all to have a chance of winning! The Fundraiser runs through the month of February.